Toothpaste works fantastic as homemade silver polish. Check it out. A little steel wool and your curling iron will be good as new. Check it out. With just the two ingredients pictured, you can easily get rid of any unwanted stamps you might find. A lint roller is all you need! Generally, a good wipe down is all these need, but if you find yours is getting particularly dirty, you’ll want to take it to a professional cleaner. Just use a bottle brush! These vacuums are particular, but there are ways to clean them. Just follow these directions. 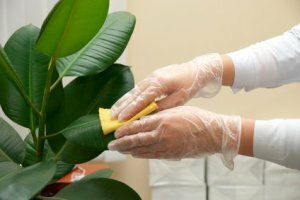 Most houseplants can be cleaned with a soft sponge and some water. Break out your iron and ammonia for this one. Check the how-to here. It’ll take a resin bed cleaner, but you can do it. Here’s how.